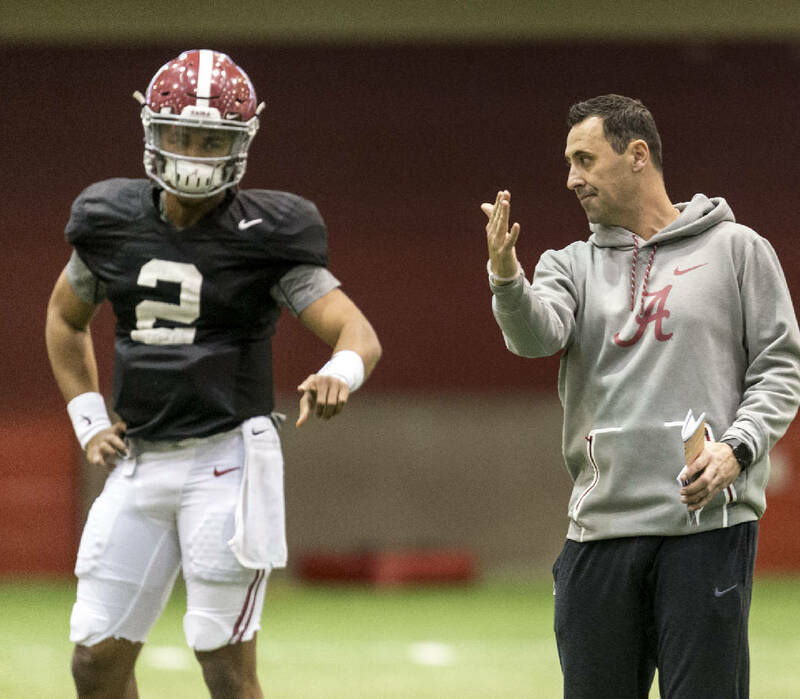 New Alabama offensive coordinator Steve Sarkisian, right, works with quarterback Jalen Hurts during this past Thursday's practice in Tuscaloosa. TAMPA, Fla. — It's not every Alabama football media event when head coach Nick Saban doesn't draw the largest contingent of cameras and microphones. Saturday was not a normal event. Just five days after going from Alabama offensive analyst to Alabama offensive coordinator and play-caller, Steve Sarkisian was swarmed with attention during the largest news conference leading up to Monday's national-title game against Clemson. It was the first opportunity for Sarkisian to speak since joining Saban's staff at the start of the season. "I don't think I could have foreseen four months ago when I was contemplating doing TV that I could get into this situation," Sarkisian said, "but I am grateful, humbled and honored that Coach Saban and the entire Alabama Crimson Tide family trusted me to do the job. "I don't think I could have foreseen it four months ago, but today and this week, it's been about doing the job and getting these players who have worked so hard for months that have put themselves in this position to play in this game to do the best job I can do to help them." Sarkisian, who was fired as Southern California's head coach five games into the 2015 season for reportedly being intoxicated at practices and speaking engagements, will call the plays from the field against the Tigers. He said it will help to be in close contact with Crimson Tide quarterback Jalen Hurts. Hurts is bidding to become the first true freshman quarterback to guide a national champion since Oklahoma's Jamelle Holieway in 1985. As an offensive analyst during Alabama's first 14 victories, Sarkisian helped former coordinator Lane Kiffin with the organization and game plans but could not work with the players in practice. Kiffin departed last Monday after three years that yielded a 40-3 record, three Southeastern Conference championships and three trips to the college football playoff with three different quarterbacks. "I think Lane did a heck of a job here," Sarkisian said. "Let's not kid ourselves. He did a heck of a job in his three years. He and Coach Saban came to the decision, and I didn't really have time to analyze the feelings of everybody and the situation of it. "I just felt like I owed it to these coaches, these players and our fans to do the best job that I could do, and that's what I've been trying to do over the last week." Sarkisian, named last month as Alabama's offensive coordinator for 2017 after Kiffin was tabbed the head coach at Florida Atlantic, said he has spoken with Kiffin the last several days. The two were assistants together at USC during the successful run under Pete Carroll, and each has headed the Trojans program. Clemson coach Dabo Swinney was asked Saturday about Sarkisian taking over for Kiffin and could only laugh. "I don't quite have those pedigrees on the sideline," Swinney said. "We've got some good guys and hard workers, but I think they're very fortunate. I mean, they've got (Mike) Locksley and they've got (Billy) Napier. Napier is as good an offensive coach as they've probably got. They had Kiffin and Billy and Locksley and Sarkisian. "It's a very seamless transition for them, and it's not like they're going to run a different offense. Maybe he calls a couple more screens than the other guy would have called. I have no idea, but it's all going to be within what they've done for 14 games." Sarkisian met with the media for an hour, and he was asked multiple times about the alcohol-related setbacks that led to his demise in Los Angeles. Saban has stressed all along that there have been no problems this season, and Sarkisian said Saturday that his battle against substance abuse was going well. "I'm at this point today because of a tremendous opportunity," Sarkisian said, "and I don't want to take away from what this really is about. This is about our team. This is about our players. This is about the job and the situation that they've put themselves in to go out and win a national championship. "To do it for a second consecutive year would be an amazing accomplishment, and that's where my focus is." Given the unique and sudden circumstances that have led to this predicament, will Sarkisian be nervous when Monday night's 8:17 kickoff rolls around? "I wouldn't go with 'nervous,'" Sarkisian said. "I'm excited. This is what I love to do. I've been doing this a long time. I've been fortunate to have coached in some big games in my career. "Obviously this is another big one. These guys have earned the right to be in this game. My mindset is just putting them in the best position to be successful."